Have you ever wondered what a back-end developer, or designer, or data scientist actually does all day? We’re starting a new Day in the Life series to answer just that question. 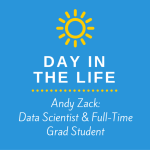 We started with Andy Zack, our Data Scientist, who is also working towards a Masters in Survey Methodology as a full-time student at University of Michigan. Here’s what he was up to this Wednesday. 8:45-9:30am I woke up, showered, and ate breakfast. I had granola with blueberries for breakfast. 9:30-11:30am My first class was cancelled, so I did homework for my second class. That class combines stats and political science–it’s called Advanced Topics and Quantitative Methods. It’s mostly stats PhD students, plus me. Recently, we’ve been discussing a Get Out the Vote experiment that ACORN did in Kansas City, Missouri. They wanted to find out whether people were more likely to vote after being canvassed. So my homework was calculating standard errors and doing data analysis on that GOTV experiment. 11:30am-12:30pm I bundled up to ride my bike across campus, and had lunch in building where I have my office. 12:30-2:30pm I talked to Sandhya, the other Data Scientist at ShareProgress, about a few projects that we’re working on for the AFL-CIO. We did two experiments for them, and we’re doing the analysis for those experiments now. One of the experiments was about different types of welcome emails—does it matter what the first email supporters get is? If they get different welcome emails, are they more likely to be engaged supported in the long run? The second experiment is about reactivating people who had been on email list for a while but hadn’t taken any actions. It’s the same experiment with the Harry Potter and robot Scott Walker emails that we wrote about a while ago. 2:30-3:30pm I worked on a project for Compassion & Choices. I’m try to find a way to predict how old someone is based on their first name and their zip code. Then Compassion & Choices can use that info to target the messages that they send to their list. 3:30-4:30pm I had a meeting with administration at school to deal with some paperwork. 4:30-6:30pm I worked on a project for school that’s also related to estimating people’s age. I’m writing a paper for that class, and I’m trying to see if I can build a model for predicting age that’s more accurate than the age info that you can get from mailing list vendors. I’m going to test the accuracy of my model on a Michigan phone survey where folks were asked how old they were. 6:30-7:30pm I got bundled up again to bike home and make dinner. 10:45pm-12:00am I had the first round of intramural inner tube basketball playoffs (yep, you read that right). It’s basketball, but you play it in a swimming pool, and everyone is floating on inner tubes. I’m on a team with my housemates, who are business school students. Usually we play against undergrad students who beat us. But this time the other team actually didn’t show up, so now my team is in the semifinals! Semifinals are on Sunday. 12:00am I got home and went to bed!